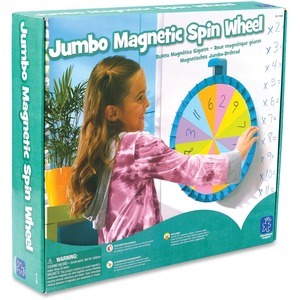 Transform your whiteboard into an interactive, whole-class game space with this Jumbo Magnetic Spinner. Simply place the spinner on your whiteboard, choose a template and use your dry-erase markers to create the games and activities you need - the possibilities are limitless. Write story prompts on the wheel spaces so students spin the wheel and work together to create a progressive story aloud. Use numbers on the wheel for counting, practicing multiplication and more. Choose classroom chores with the spin of the wheel. From a classroom management tool to subject-specific games, the Jumbo Magnetic Spinner gets students on their feet and participating. It includes jumbo 16"" magnetic spinner, three double-sided write-on/wipe-off cards, and teacher guide with 16 classroom management, math, language arts, readiness and other activity suggestions. It is not recommended for children under 3 years of age.